How Soon Can I Expect Delivery of My Gold Coins or Bars? My Cheque Cleared on Wednesday. Why Has My Gold Not Arrived? We explain, clearly we hope, that for gold bullion orders we allow a full week for cheque clearance, after which we make the gold coins or bars available for collection or despatch within 48 hours. In effect this makes about 10 days between us receiving your order and you receiving the goods. To this you need to add the time it takes for your order to reach us. There are a combination of factors. Bullion or investment gold is normally dealt at quite small margins. 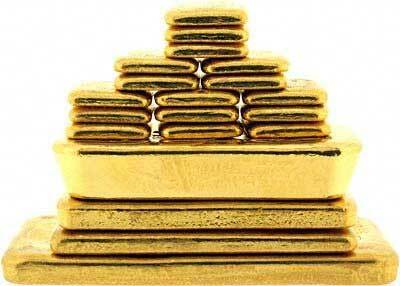 Most investors wish to obtain their investment gold at the best possible price. To allow us to deal at fine margins, we need to reduce our risks to a minimum. To achieve this, we necessarily have to adopt a very cautious policy. Smith posts us his cheque with order on a Friday by first class post. We receive it on Saturday or Monday, and bank the cheque on Monday. The cheques arrives at the Bankers Clearing House on Tuesday. It reaches Smith's bank on Wednesday. His bank have until close of business on Wednesday to return the cheque if it is unpaid. It may show on his account and statement as being debited before 9 a.m., but it does not alter the fact that his bank may allow until about 4 p.m. for him to arrange funds to meet the cheque if necessary. If after 4 p.m. the cheque is not being paid by the bank, it will normally post it direct to our bank by first class post. Our bank may receive the unpaid cheque on Thursday subject to the post being reliable, in which case they will post us the cheque together with a debit note, for exceptionally large amounts, they may decide to telephone us. Again subject to the post being punctual, we may receive the advice from our bank on Friday. Bearing in mind most people's scepticism about the postal service, there could be from a day upwards to add to the above. This is why we don't consider Smith's cheque to be cleared until a full week after we received it. We usually then collate and pack the order on the following Tuesday, and post it on the Wednesday. As most of our bullion orders are sent via fully insured Special Delivery, the Post Office guarantee delivery before 12 noon the next weekday, which is Thursday in our example. Obviously any bank holidays add to the delay in the above example. A few words from the experts. We came across the following paragraph on the APACS website. It confirms most of our comments above, although we note that they do not specify any upper limit on the time it may take for a dishonour notice to reach the payees bank. Cheques which are to be dishonoured (bounced) are returned by first class post (normally on day three) direct to the collecting bank branch or in some cases a central returns unit within the collecting bank. Therefore, the earliest that a collecting bank can know about the dishonour of a cheque is the morning of the day four. However, in some circumstances the decision regarding dishonouring a cheque can be delayed until the day following presentation. Where the cheque concerned is above £500 the decision to dishonour, if taken during the day after presentation, must be notified to the collecting bank by telephone by 12 noon. It is possible, either owing to postal delays or because the decision to dishonour the item has been taken on the day after presentation and the item is below the £500, for notification to be received two or more days after the day of presentation. For this reason, banks and building societies will normally not allow customers to withdraw funds until at least the fourth day. This is, however, a matter for the commercial judgement of each institution. Many people find it convenient to have their delivery arrive on Saturday which may be the only day they are at home to receive their mail. We are happy to mail goods out on Friday, and the Post Office will normally try to deliver it to residential addresses on Saturdays, but please note that their Special Delivery service only guarantees next weekday delivery, so items sent on Friday are only guaranteed to arrive on Monday. If you are not sure whether your Special Delivery post will be delivered on Saturday, it's best to ask your local postman or delivery office. Your local delivery office may have a policy of not trying to deliver Special Deliveries to business addresses on Saturdays. There is more information on our Terms & Conditions page.